Behold a land rich in history, abundant wildlife and the best of nature’s enduring wonders. A quiet, understated place where a romance with the open range unfolds before you and lifelong memories are created. discover the abundance of experiences at Sun West Ranch. Watch a mother moose and her calf while sipping morning coffee, explore acres of sprawling meadows on horseback, or spend an afternoon casting into the trout-rich Madison River. Fresh mountain air, breathtaking views, and endless big sky are second nature here. Breathe. You have discovered the magic of Sun West Ranch. Located in the beautiful Madison Valley, Sun West Ranch invites families to build a home here and immerse into the landscape. 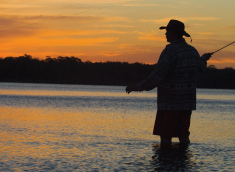 With over 80% of the land protected from development and hunting, children and adults alike can find connection with this abundant nature and preserve it for future generations. Reeling in that prized rainbow trout, spending a day on horseback through private aspen-lined trails, evening fireside get-togethers with friends and family, watching the last rays of sunlight disappear behind the mountains—all unforgettable and cherished experiences that begin here. As the only shared ranch community in the Madison Valley, experience the pride and lifestyle of authentic ranch ownership without the day-to-day operations. Peaceful and private, you can build your custom home on one of the limited number of premier home sites plotted for optimal views and seclusion. The benefits of owning a homestead extend to a membership in the Sun West Ranch property owners’ association and rights to use approximately 1,600 acres of common area wilderness. 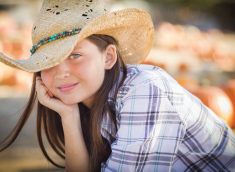 Plus a full-time ranch management team is available to maintain and care for your home and your horses when you are not there, as well as prepare your property for your arrival. At Sun West Ranch, there is opportunity to embrace the true essence of an independent and carefree way of ranch life in Montana. 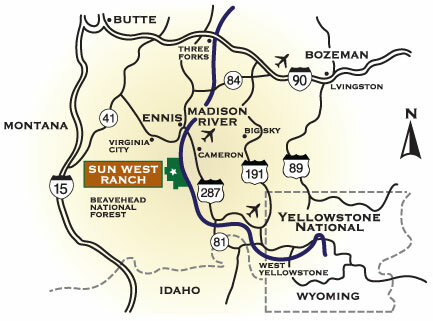 The 2,000 acre Sun West Ranch lies in the heart of the infamous Madison Valley, just 30 miles south of Ennis and 40 miles northwest of Yellowstone National Park. 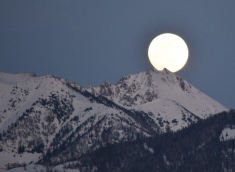 The valley is bordered by the Centennial Range on the south, Tobacco Root Range to the north, Gravelly Range and Beaverhead Deerlodge National Forest to the west and Madison Range to the east. The legendary Madison River flows through three miles of Sun West Ranch, heading north to Three Forks where it converges with the Gallatin and Jefferson Rivers to make headwaters of the mighty Missouri River. The land encompasses a variety of terrain from gradually elevating benches to timbered mountains and vast meadows sprinkled with wild flowers. In order to maintain this natural beauty for generations to come, renowned Montana architect, James Morton AIA, carefully hand-selected the limited number of home sites for optimal seclusion and panoramic views. Custom-built homes are discretely located in aspen-lined draws, in stands of evergreens or on open grasslands, all blending in with landforms to preserve the beauty of the Madison River landscape. Madison County is known for its “Blue Ribbon” trout streams, gorgeous lakes, panoramic mountain scenery and endless recreational opportunities, including fly fishing, horseback riding, hunting, hiking, biking, skiing, snowmobiling, and white water rafting. The quaint town of Ennis, about 30 miles north, has a population of about 1,200 and is a quiet cowboy town where locals and newcomers come together. At an elevation of 4,985 feet with surrounding peaks ranging to 11,300 feet, it offers restaurants, a market, golf course, a new hospital, Madison Valley Medical Center, emergency helicopter services to larger medical facilities, a school, and a variety of fishing and hunting outfitter shops, which offer guide services. Six miles south of Ennis is a small, private, full-service fixed-base operations (FBO) airport. Virginia City, a preserved historic western town is located 40 miles away. Explore the history of Alder Gulch, home to the largest gold discovery in North America. Walking the boardwalks of Virginia City and neighboring Nevada City, is a trip back in time. The city of Bozeman is about an hour’s drive to the northeast. It is the home to Montana State University, Museum of the Rockies and a growing number of high-tech corporations. Often voted as one of the “Top Best Places to Live” Bozeman has many cultural events as well as world-class shopping and fine dining. Bozeman Yellowstone International Airport (BZN) is conveniently located on the outskirts of Bozeman. Private aircraft can use a variety of services from the FBO airport at Gallatin Field. Yellowstone National Park, the country’s first national park, is located 40 miles southeast of the Ranch. 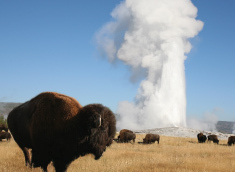 As part of the Greater Yellowstone Ecosystem, it is home to several natural wonders including Old Faithful, the Paint Pots, and the Grand Canyon of Yellowstone. Visitors will enjoy pristine scenery, fishing, wildflowers and wildlife. 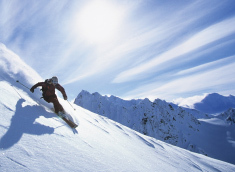 There are many resorts within easy reach of the ranch including Big Sky Ski Resort and Moonlight Basin with more than 5,500 acres of skiable terrain. The community of Big Sky is also home to Lone Mountain Ranch, the # 1 Nordic Ski center in North America with 80 k of groomed ski trails. In addition, the area offers outstanding summer recreation such as golf, zip lines, hiking and mountain biking. Living at Sun West Ranch is living in fly fishing paradise. Within an hour’s drive south, you can fish Henry’s Lake, Henry’s Fork of the Snake River, Hebgen Lake, Quake Lake and streams in Yellowstone National Park. Heading northwest, anglers will discover the waters of the Ruby, Beaverhead, Jefferson, Wise and Big Hole Rivers; To the north, the fisheries include Gallatin and the Missouri rivers. And to the northeast, the Yellowstone River and several nationally recognized spring creek fisheries are located in the Yellowstone Valley. However, there is no need to travel far. The ranch is located within 5 miles of 13 lakes and 13 streams. Experience the ranch lifestyle without all the work. Sun West Ranch is a shared ranching community where common areas encompass over 80% of the ranch, and homeowners can enjoy all the benefits of ranch ownership without all the responsibility of taking care of the ranch. A year-round, on-site management team oversees the operation and maintenance of the ranch’s common property. Our full time on-site management team is just a call away. In addition to overseeing the day-to-day operations of the ranch, they are also available to assist owners with maintenance and repairs to providing hospitality services. The team maintains the trails and landscaping, restocks the ponds and provides security. Owners can rest assured that their property and investment is in competent hands while they are away or on location.